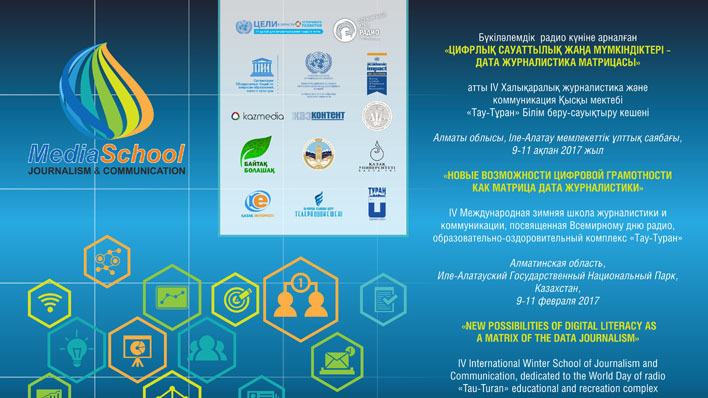 Mediasphere Centre for Humanitarian Studies of al-Farabi Kazak National University is organizing the Digital Literacy Winter School with the support of UNESCO Almaty Cluster Office, the United Nations Information Office in the Republic of Kazakhstan, Club of Chief-Editors, Kazakh University Publishing House and Turan University. 150 journalism students and media professionals from Kazakhstan and Kyrgyzstan will participate in the three-day debates (9 - 11 February), workshops, trainings. The Digital Literacy Winter School contributes to events devoted to the World Radio Day in Central Asia 2017. The official World Radio Day website is now online, with all organisations encouraged to sign up to register their events and special broadcasts on the world map, as well as access exclusive content and resources for how they can help to bring listeners to the heart of radio. As part of the 2017 celebrations, a signature event will also be held in Shanghai, China with the support of the Shanghai Media Group and European Broadcasting Union. A full day of radio-related discussion involving some of the leading figures in Chinese and global media will be followed by a special Chinese New Year concert dedicated to the Day. World Radio Day was first celebrated in 2012, following its declaration by the UNESCO General Conference. It was subsequently adopted as an International Day by the United Nations General Assembly. Previous annual themes have included gender equality, youth participation, and radio in humanitarian situations. In 2016, more than 380 World Radio Day events were held in more than 80 different countries.